Way to go Yafe! So glad to see him doing better. Great job Dave and Katie! Let the good times roll! Aww, he seems so sweet! And so chill! Glad he's feeling better. YAY!!! I am so happy he ate, and exuberantly at that! Maybe a little too exuberantly, lol. He probably didn't have much opportunity for climbing previously, so I'm sure he'll figure out how to eat more efficiently with time. A rat fuzzy still probably isn't a bad idea. With his size, I'm thinking he may have been on those at the breeder? I look forward to many more happy updates about Yafe. No, not much climbing at the breeder; rack system. He was eating small/weaned mice at the breeder when they shipped him and he had only lost 5G over the 7 weeks of not eating and having the RI (which I thought was a great sign and a big reason I never gave up on him). I plan to feed mice until he can take weaned rat (about 30G). I believe small mice and adult mice are more nutritious than rat fuzzies and hoppers, but want to switch him over to rats ASAP, and do not see big difference between an adult mouse and a weaned rat. I look forward to sharing many more happy updates on Yafe! I told ya, he just needed a bit more time to feel safe again after his last outing, once things became "routine" again, he felt comfortable enough to eat. Thanks Zina10! Katie, Yafe, and I, all appreciate the support along the way. Don't think I won't talk about Aunt Zina10 20 years from now when I talk about baby Yafe and all he went through and how supportive you were! Those PM's helped a lot and kept me focused and calm. He hasn't had much practice eating yet, to know how to navigate branches & obstacles. I'm glad you tried again & with one a little smaller for now...no rush. Feeding larger prey to a snake that hasn't been eating at all isn't such a good idea anyway. Easy does it. Yeah, I am glad I tried a good in between size too. He had the 9G hopper 2 weeks prior. I agree, the 19G was too big, he told me that, but it was a catch 22. He wouldn't strike at the smaller prey (except the one out of total desperation that he ate) and I had to get him going and eating. Hey, for all I know, the 19G got his food drive going!?!? When I offered the 14G mouse 3 hours later, he was on that like white on rice! He couldn't strike that mouse, wrap it, and swallow it, fast enough! You've both done a BEAUTIFUL job of getting Yafe well again...I fully expect he'll be eating regularly from now on too. HAPPY DANCE! He won the lottery when you bought him, you've worked SO hard to help him! Good vet too! Awwwwwww, shucks, Bogertophis! That means a lot. I really want to thank you also. You've been incredibly kind and supportive through this entire ordeal. I knew I could count on your kind words and encouragement virtually every time I posted something about Yafe; good or bad. As far as I am concerned, Yafe deserved all the love and care he got. He's really a good little dude. Now that I am getting to know him and he's able to show his personality, without all the health issues, he really is a calm and docile and sweet guy. I am so happy and relieved he made it and he's going to be awesome for a long time. He never quit and I really respect that and there was no way I was going to quit on him. I can also relate. It's not just the kidney transplant and kidney disease and all the ancillary problems from all that making my daily life a struggle that I have coped with in my life. When I was born, I was born premature, 9 weeks early (and in 1980 - not good - technology was not what it is today). In addition to normal premature baby issues, I had lung issues and my right lung collapsed 24 hours after birth. I was lucky, I was 4 pounds 2 ounces, which is big for a baby that early. That helped. The doctors gave me a 10% chance of survival. My Grandfather's cousin, a doctor, told my Grandfather, I was going to make it, he could tell, I was a "fighter." He said I would have health issues my whole life, which I have, but that I would get through that. I've had a lot of issues in my life, not all health issues, and some that I won't share here, but I don't let anything stop me. I keep forging ahead. I know Yafe can't articulate, or even conceptualize that, but he's got fight. In yiddish, we use a word, "chutzpah," meaning "balls, guts, gal," etc. Fitting since he's got a Hebrew name. Either way, he's got it. 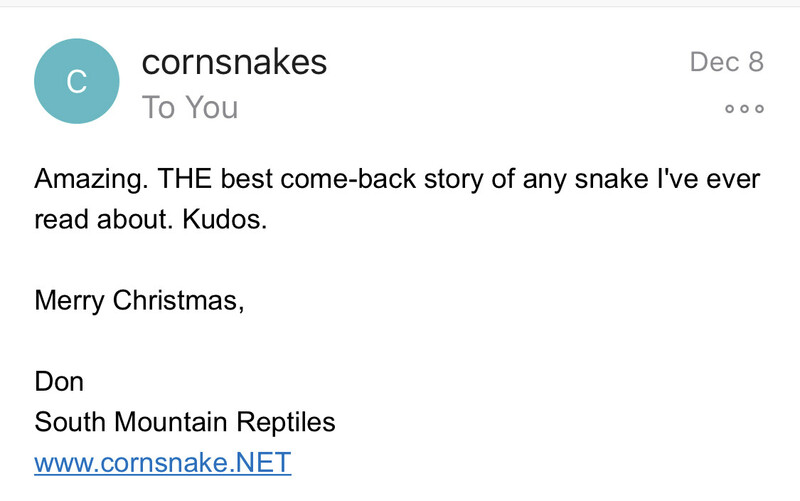 I have become friends with Don Soderberg at South Mountain Reptiles, Solana's breeder. I've been keeping him in the loop on Yafe. When I originally told him about the RI, he was 50/50 about me taking him to the vet versus letting him be. I told him, Don, "I've seen mild RI's before in BP's I've fostered. This is not that. This is life or death. I need to intervene." Don was also concerned about finding a good vet, but I wasn't worried about that, as I had one, and I knew what tests needed to be done, what questions to ask, etc. I have kept Don in the loop since day one. When I told Don that Yafe ate, after 7 weeks of ups and downs, 30 days of Ceftimazidime injections that were only partly effective, and 21 days of Baytril nebulizer treatments, while still having symptoms, he said, "I had written him off a long time ago. I have no doubt you saved his life." Don sent me the following the other day after Yafe took his second meal and was symptom free. I also want to add here that you, and others here, have thanked Katie as well. She deserves MAJOR KUDOS! First, she didn't want another snake. We got Yafe. Then he shows up and is near death within two days. She comes with me to the emergency vet until 3AM and then goes to work the next day. She gives him injections, ten, over 30 days, because I can't because I shake too much due to kidney transplant immune suppression meds. 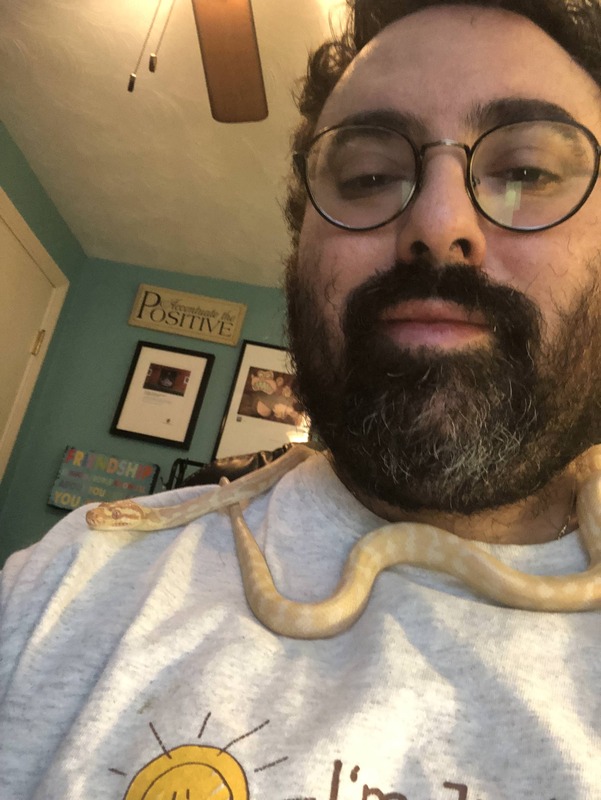 She's never had pet reptiles until I moved in, now she has a ton, some of which she knew were moving in and some of which came after the fact (Yafe included in the latter). She had never even held a snake until she met me a year before I moved in, and now she's giving injections to a yearling Carpet Python! Secondly, Katie, like me, has anxiety at times, and was literally a nervous wreck leading up to, and giving Yafe, each injection. However, each time, she rose to the occasion, and fell apart after. She handled the stress and didn't take it out either me, or Yafe. This is a woman who not only loves me with all her heart (as I do her), but supports me in my passions, even when some of them they take over 1/3 of our finished basement, and include chest freezers full of rodents in the storage area, and even bugs in her house for 4 out of 6 lizards, and sometimes take time away from Katie and Dave time. Talk about love! Thanks brother! As mentioned above, he's a fighter! GO YAFE indeed! He's doing awesome man. Can't wait to share his progression. He's adorable and a great snake. Handsome and calm and sweet. What else could I ask for? Giving encouragement is the EASY part....you & Katie have pretty much pulled off a miracle with Yafe. When it comes to pet care of any kind, you're a tough act to follow! Thank you again Bogertophis. I don't know what to say. I did what I know how to do and I would have done 100 out of 100 times. Either way, to have such great people, and such experienced keepers, tell me, repeatedly that we did a good job, I should just take it in, huh? Yafe and Dad had some bonding time today. Starting short handling sessions with him. What a mensch. Total sweetheart. He was slithering by my ear and I heard a crack/pop and my heart stopped. 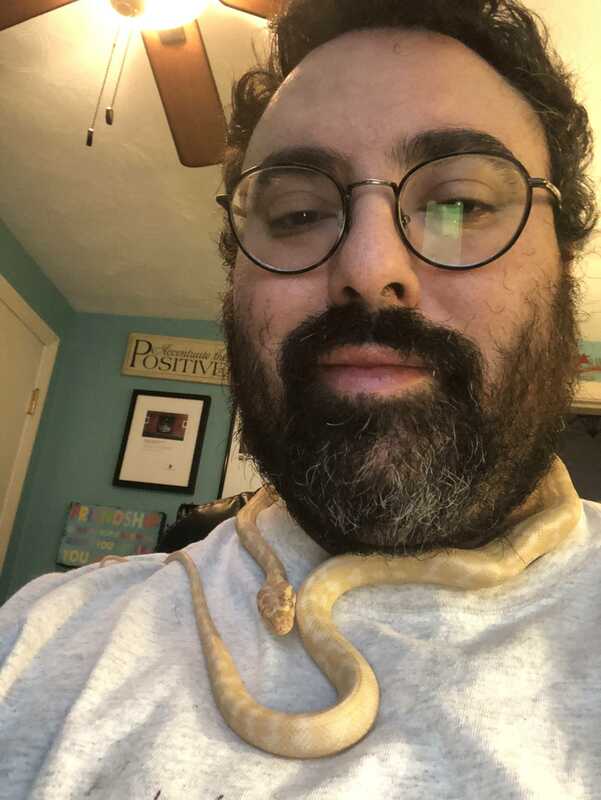 I heard another one, but his head was halfway around my neck. Very linty shirt! His little scales were catching on the little lint pieces on my t-shirt and when they pulled out they went "crack/pop" really quiet. Well, that's my heart attack for this year! Last edited by Bogertophis; 12-10-2018 at 01:50 PM. I had Yafe out tonight for a few minutes, and good news and bad news. Good news. He seems great. He's active and calm and tongue flicks galore with now signs of mucus or a returning RI. Bad news. He made a few popping sounds when he wrapped around my arm and gripped me tight. To be clear, when he made the sounds, they were quiet/mild and he showed zero discomfort when he made them. In the past, when he gripped me, and made the sounds, he would grip tighter, and was clearly uncomfortable. None of that tonight. I think it's either the first time since he's felt better he's really gripped something tight and there was a little residual gunk clearing out, or there's some residual gunk is his nasal cavity that I am hoping a good shed will clear out, or time will. I am about 99% sure that if the RI was going to come back, it would have done so by now. He's eating, he's peeing and pooping, he active, he's acting happy, and he's not making the noises often or consistently. Additionally, he has yet to rest with his head up in the past 2 weeks. He is always resting/sleeping with his head down or flat. I wanted to update everyone, but to be clear, I am NOT concerned. This is more informational and for others that might have a snake that has gone through an RI, they can heal, but still show residual symptoms for a while. I am very convinced that he is fine.